Bottes de traqueur de gronn seem to be a good match for this set. Belts are a little harder to shop for, but I'd personally go with something like Ceinture rivetée dépravée or Ceinturon en tisse-os. Étreinte de Dory is a nice cloak to go with this set. This is Chasseur 10 player Tier-8 from Ulduar. There are also three other colors. Grèves du lieur de terre are a perfect match for boots. Probably overlooked as they have shaman specs. 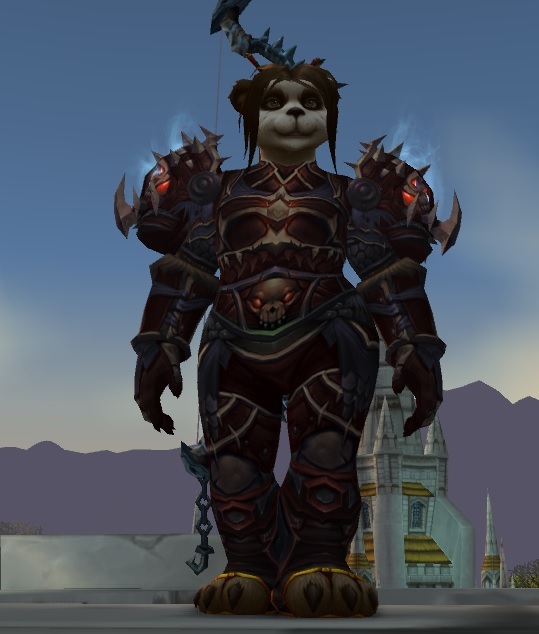 I currently have them mogged and look great in game. They even drop in 10man Ulduar with the rest of the gear. Eperons en peau écailleuse go REALLY well with this set. I only wish the yellow lining was more beige, and i wish the boots were a lil bit thicker. Other than the aforementioned Ceinturon du choc nocturne, Ceinture de rôdeuse and Cordelière d'orage seem to match pretty good. For boots, I think I'm going to go with Grèves du désespoir cinglant. The bloodied, bandaged look seems to go well with this set. For cloak, Cape de la belladone or Grande cape brise-jambes/Capebrume de vent gris. Arc maudit de l'élite matches near perfect. I would like to try the previously commented Bottes du vol renouvelé, however I haven't been able to get them to drop quite yet. Themios le Porte-l'ombre a very good choice, perhaps the best choice, I am currently using it. The overall colors of the bow match well, the fire is a little off but it gives the bow a wicked look to it. Vishanka, les Crocs de la terre The bow from the final Dragon Soul raid encounter, in this case normal mode. The red isn't quite right but the overall build of the bow matches well. Arc doré de Quel'Thalas Absolutely gorgeous bow, however the coloring gives it a shiny appearance versus the darker color of the armor. Even so though, it is a very good choice. Arathar, l'œil de la Flamme The red isn't quite right, however it works in a pinch. Canon à main kor'kron Although the page says it is no longer available, there are several of the same model red version of this gun. Currently using Cape de la belladone, same as Cape de la flamme noire, Cape de noctambule, and Cape sans pareille. These are BOE, so you can hopefully find them on the AH like I did, because they have a low drop rate. Of course there are other choices, a lot of the Orgimmar color cloaks work well, as does Cape de puissance dominée. There are honestly a lot of reasonable cloaks with this group, I just picked the one I did because the dark red around the black really looked the best to me. Tabard de Mag'har My tabard of choice, although, again, a lot of the Orgrimmar colored ones work. 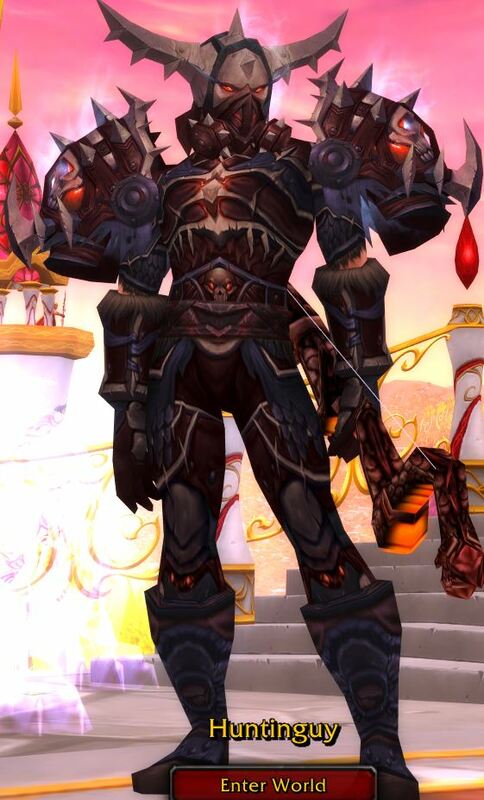 I am currently using the best from one of the other Ulduar sets, the Ceinture de la fosse sanglante. Because it was designed for an alternate color but the same set type, it matches fairly well.